I want to write a love letter to my WC. I’ve been away from home this summer, using different bathrooms and I came to realize all the things I truly love about my bathroom. I realized how perfectly it fit our needs, and how easy it is to keep clean and bright. And if you are planning to remodel or build a new powder room maybe you can use some of the solutions we found for our severe lack of space. But as you can imagine, for our laneway home we had to make some sacrifices. Because our bathroom is eensy, weensy, teensy. 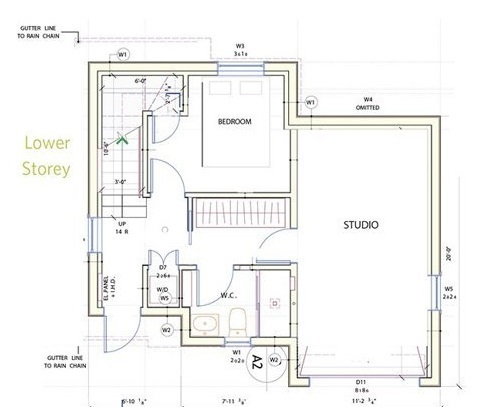 Seriously, check out the plans. The bathroom is less than 8 feet wide. So it took some planning to get everything we wanted into the room. But we did! 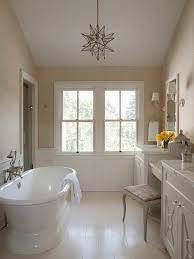 One of the features that we appreciate so much is the radiant floor heating. We moved into our place in winter, and we couldn’t believe the difference it makes to your comfort. In our planning with the designer we ditched the tub. 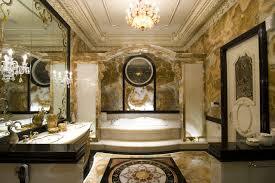 We prefer a shower so it would be a waste of precious, precious space to put in a tub. Then we decided to keep everything square and linear. 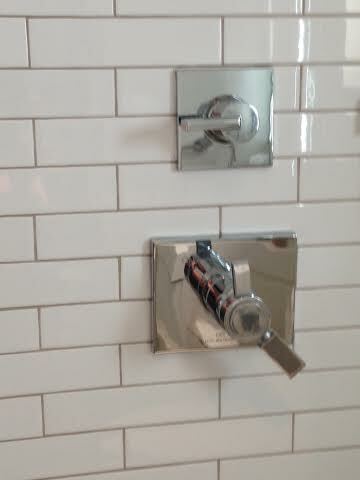 We wanted subway tiles to line the shower, nothing fancy that dates so quickly, just the classics. 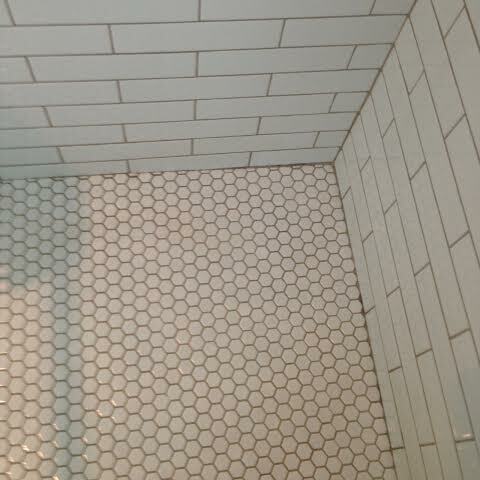 Honeycomb tiles on the floor of the shower to help make it less slippery. Nice and clean looking. Plus the clear glass doors make it look as if the shower is part of the whole room, there’s no visual separation. And we have a handy niche to hold our shower needs. There are those honeycomb tiles again. 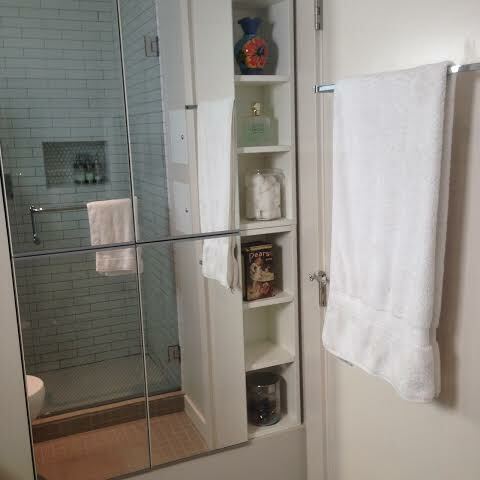 Having that little shelf seems like such a no-brainer, but DH’s shower in our old condo didn’t have one. It makes a huge difference. 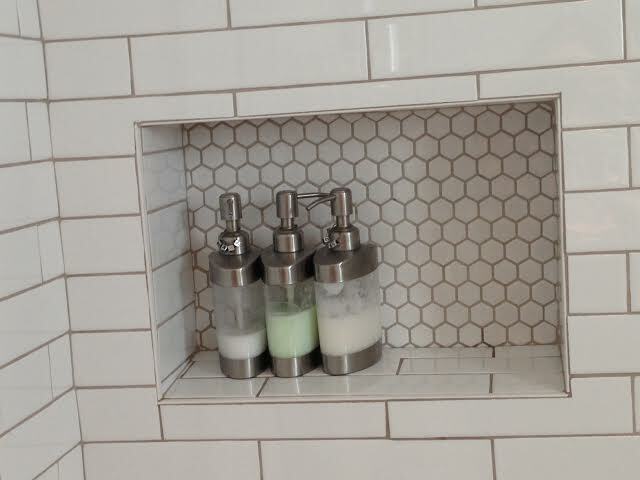 You’ll also note that we empty our shampoo, conditioner, and body wash into little bottles (from the dollar store) which keeps the space looking less cluttered. The shower itself delivers what we really want — comfort. 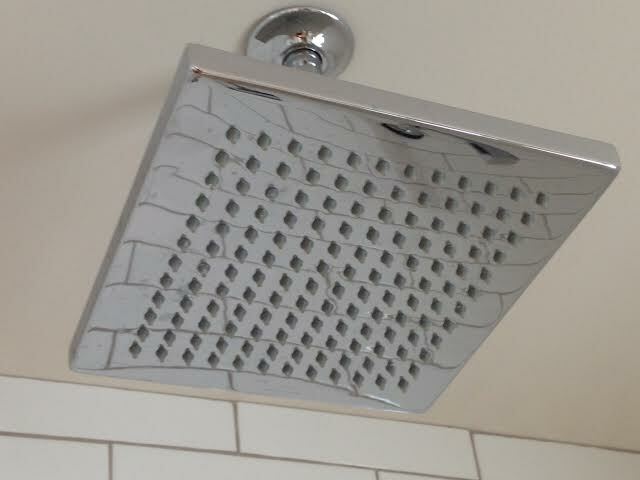 We have a rain-shower head — one of the first things to go on our list of features we wanted. We also have a shower wand for when we want to pretend it’s a microphone. C’mon who doesn’t do that when they’re singing in the shower? The controls let us set the most comfortable temperature, and turn it on immediately without fussing and fidgeting. Square shape again — see? It keeps the look uncluttered. 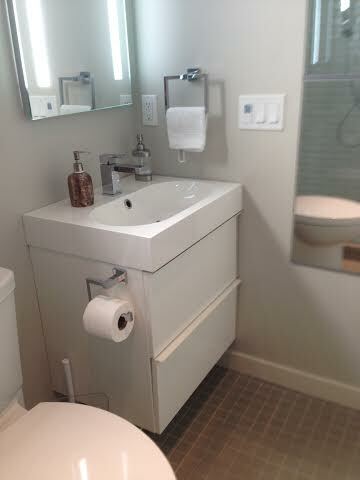 The toilet also has features we want — clean lines right down to the floor, and the seat closes with a gentle movement (the first days of my holiday were spent apologizing for noisily dropping the toilet seat cover, I was so used to it dropping softly onto the seat at home). Yes, it’s a little thing, as is the feature that the whole seat lifts off the toilet for super-easy cleaning — but it’s just one of the things I love about our bathroom. While we were on the Heritage Foundation’s laneway house tour two years ago, we saw the IKEA Godmorgen system. We loved it at first sight — clean lines, storage space, and it floats above the floor to give the illusion of more space. We also solved the problem of having no room for sconces beside the bathroom mirror with a great mirror with the lights built right in. Again, square towel and toilet roll holders. Square faucet and tap. There’s also something in our bathroom that I never thought I needed — a clock. The light/fan switch has a little digital clock to control the fan for ventilation purposes, and it’s so handy! Up in the middle of the night — check out how long you can sleep before the alarm goes off. Getting ready for work? You can schedule your makeup/hair time and NEVER BE LATE AGAIN! In this shot you can see the little square tiles on the floor — they are quite slip proof when wet, another safety feature as we age in place in this space. Storage is always at a premium in any bathroom — so our designer, Laurel, found a great way to increase ours. There’s an inset in the wall the bathroom shares with the washer/dryer closet. And into it, Laurel placed two IKEA Lillangen cabinets with mirror doors. As well as giving us lots of storage space, the cabinets give us a full length mirror. There’s practically no other space for a big mirror, so this is really appreciated. Plus it reflects the light and brightens the whole room. We bought all white towels for the new bath — gave away all our multi-coloured towels to keep things beautifully clean and white. Plus if one gets stained it’s easily replaced — white always goes with white. 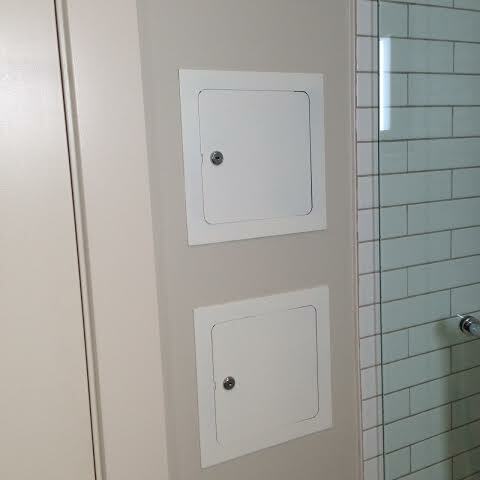 There’s also something Laurel suggested that we had never heard of — lockable valve boxes set into the wall for storage. We can lock our prescription drugs away for when the little ones are around. They’re also handy for holding our jewellery when we’re not wearing it. It’s so indicative of the comfort and ease we find in our home that our bathroom (is it still a bathroom without a bath) is so perfect for us. Hope you can find a couple of good ideas to incorporate in yours! Posted in Laneway House, Small House and tagged Decor, Laneway House, Small Style. Bookmark the permalink. 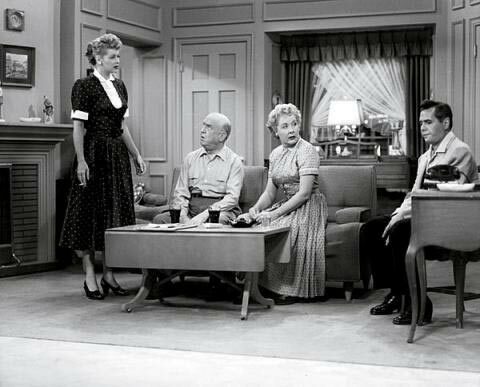 Classic TV shows had great homes. 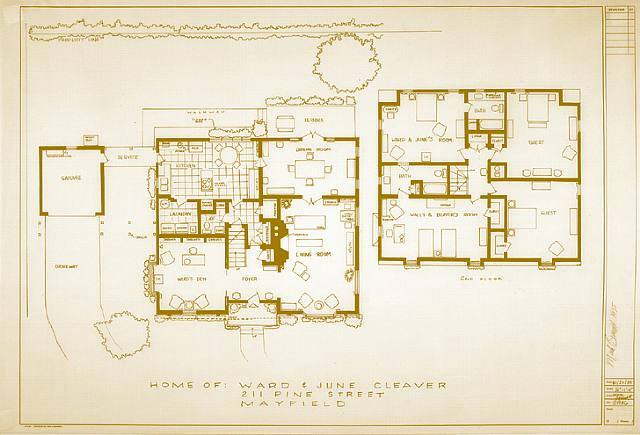 Roseanne aside, houses were meant to be aspirational, just a little bigger/tidier/nicer than our own, so we could relate without really noticing them. They were sets, not characters. Or….were they? Didn’t they become characters in the shows? 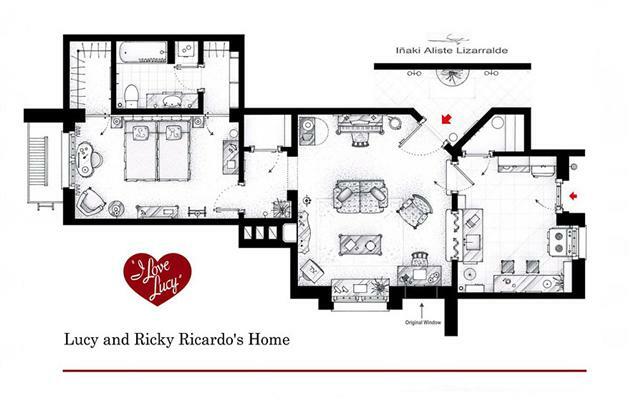 Thanks to artists Mark Bennett and Inaki Aliste Lizarralde we can revisit those oh-so-familiar homes through their floor plans. 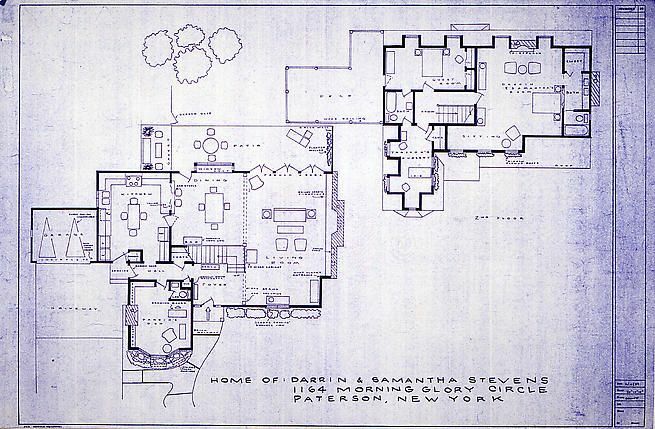 Even with four bedrooms (and 2.5 baths) Wally and the Beav shared a room. 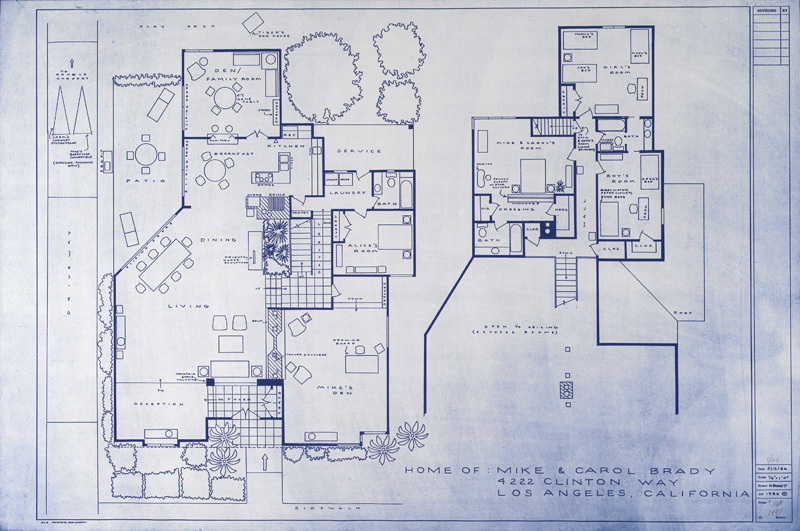 Of course, Mike Brady was an architect, so his place reflected the open-concept, shag-covered tastes of the time. But all these houses had one thing in common, something that shows itself in the reruns of the shows. Sure, they were bigger than our homes. Nicer and newer and just better. But they weren’t huge. 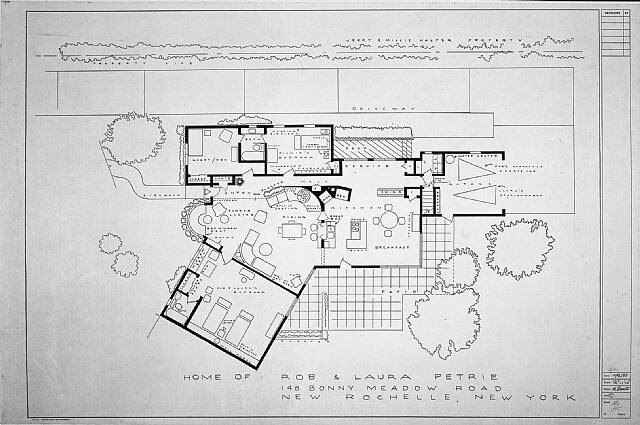 According to Life Edited, in 1950 the average floor space of a house was 983 square feet. By 2012 that area had grown to 2,662 square feet, and there were fewer people living in the house. Over the years we got used to the idea that we needed more rooms. But we really don’t. No one used that formal dining room. No one sat and chatted in the lovely living room. Those spaces weren’t needed. And they are expensive in terms of heating, cooling, cleaning, decorating. The more house the more money you need to support it. And to build it. Let’s start thinking and planning how we want to house ourselves in this new century. Let’s leave our fantasy homes on the screen. Posted in Housing, Laneway House and tagged Laneway House, Small House. Bookmark the permalink. How have I been occupying myself the last couple of weeks? Not by writing blog posts. No, I have been waiting. We slipped away for a week to our usual holiday spot, but the rest of the time I was waiting. Brooding. 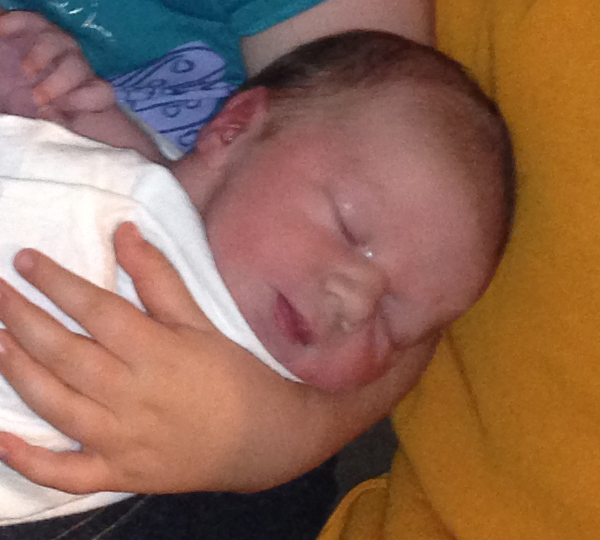 Sitting in my empty nest and waiting on the arrival of our newest BFF — our grandson. This long weekend I watched a Dr. Who-athon on Netflix and knit a little blue sweater as my daughter patiently waited for her son to be born. And now he is here! He arrived on September 1, and is a bonny lad. We are all madly in love with him, especially his sister. How like her he is! The best thing about this wonderful experience is that we now live right next door to these wonderful people, and can visit them whenever we want! There are not many grandparents who have that chance, and I realize how lucky we are. Soon I will be back to the regular content of the blog, but for now I will be gazing into that beautiful face. Darling Douglas.